Future Forests Research Limited (FFR) is developing a proposal for an extension to the current Primary Growth Partnership (PGP) research and development programme "Innovative Harvesting Solutions". The current PGP Harvesting programme is starting to realise substantial gains in productivity and safety of harvesting operations on steep slopes through improved harvesting technologies. This has been catalysed by the commercialisation of the ClimbMAX steep slope harvester, the development of camera systems to improve hauler operator vision, and enhanced log grapple control systems such as the Alpine Grapple and the Falcon Forestry Claw. The scope of the original programme is focused on the mechanisation of tree felling, breaking out and cable extraction functions. The new proposal aims to build on these initial benefits in terms of significant improvements (of the order of 40%) in log manufacturing productivity to match the increased hauler production, without compromising log value recovery or safety. The vision of this new programme entitled "Optimised Processing and Logistics System" (OPALS) is reduced log supply chain costs and improved worker safety. This is consistent with the overall goals of the original programme: to increase productivity, reduce cost and improve the health and safety of workers in the forest industry. Opportunities have been identified to improve the efficiency and reduce the cost of log manufacturing and at the same time automate log product labelling, provide real-time information to improve product tracking and inventory management across the supply chain. One exciting area for development is in laser etching product information on to log ends, to provide information on each log product at all points of the supply chain (see figure below). Other parts of the programme will focus on optimising log distribution and provide the potential to automate log measurement (including export log scaling) processes. This proposal is aligned with the NZ Forest Owners Association's Science and Innovation Plan which recognises that more research work is needed on developing a systems approach to improve productivity and profitability in the forest industry. FFR is pleased that PF Olsen Ltd, along with other forest industry companies, has committed to supporting this new and exciting proposal to improve log processing and logistics. 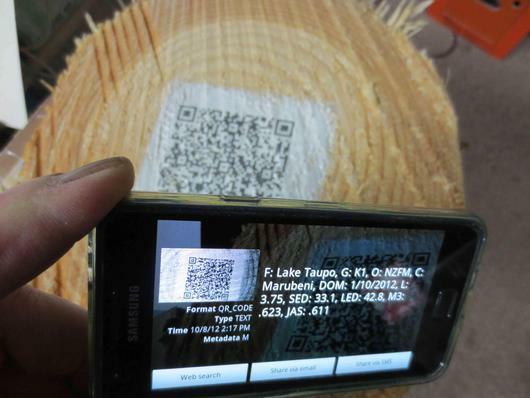 Prototype laser etched QR code on crosscut log end showing data read by smartphone QR scanner.